Back in January Google wrote about the importance of the amount of visible content on a page once you click on a search result. Nobody likes having to scroll down just to be able to see the content you visited the page to see. Google said: “As we’ve mentioned previously, we’ve heard complaints from users that if they click on a result and it’s difficult to find the actual content, they aren’t happy with the experience. Rather than scrolling down the page past a slew of ads, users want to see content right away. So sites that don’t have much content “above-the-fold” can be affected by this change. Hell yeah, we thought. Enough with these sites that bombard visitors with ads and other above the fold rubbish. As such, it is somewhat of an irony to look at Google’s own web pages, specifically those for high value search queries. Take the following example, for a search on the term ‘credit cards’. Let’s firstly look at the breakdown of the page estate. The following screenshot (click to see a full size version) represents a fully expanded browser window on a 1,280 X 1,024 monitor. As you can see, more than 51% of the page is devoted to ads. The top and the left side is devoted to navigation and functionality, representing about 31% of the page. And what remains, the natural search results, account for just 17% of the page. But that’s if you can see them at all. It turns out that most people can’t see these results without scrolling down. By pushing this screenshot through Google’s Browser Size tool (perhaps tellingly, it won’t allow me to paste the actual Google URL for this page into the tool!) we can see how many people will – or won’t – see certain parts of the page, based on what kind of device they’re using. UPDATE: I’m inforned that Google is killing this off, so here’s an alternative browser sizing tool that you can use. What you can see in the above screenshot (click on it to expand to full size) is a bunch of contoured areas, which represent different screen resolutions. The percentages are the number of people who can see these parts of the page. It transpires that only 40% of Google’s visitors will see the title of the very first natural search result for this particular search term. 90% of visitors won’t see the third result without scrolling. The majority of visitors will only see ads, and navigation… unless they scroll down, which was the thing Google’s page layout algorithm was seeking to banish from the third party sites it indexes. This isn’t a new trend though, as far as Google is concerned, even though it is something that the firm’s search engineers are trying to dissuade other sites from doing. Universal Search and new product search tools (such as the ‘Compare credit cards’ unit in the above screenshots) have gradually eaten into the page, to the point where six out of ten people need to scroll just to see the number one search result. Nevertheless, it is a bit of a concern. I’d love to know how this has impacted on CTR for both organic and paid search. Should SEOs be worried? Will paid search agencies be rubbing their hands? Or should Google itself be concerned? You have to wonder how many more levers Google has left to pull, in order to further boost ad revenue (not many). How long before we see bigger fonts and flashing ads? I jest, kind of. What do you make of it? With the Microsoft Yahoo Search Alliance having finally made it to Europe, we looked at whether companies and agencies would be considering spending more money on the platform, particularly given concerns about Google’s near-monopoly within the UK search engine market. 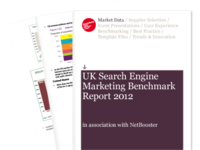 For our UK Search Engine Marketing Benchmark Report, published in association with NetBooster, we asked companies how they had changed their paid search budgets across Google, Microsoft/Yahoo, and other search engines. Quiksilver recently revamped its European websites as part of what it calls “a very aggressive market expansion strategy”. The sites, which were launched using Demandware, use a range of interactive and visual features that it claims offer an enhanced user experience. But aside from all the new graphics, is the site actually easy to buy from? Multi-screen activities while watching TV are very common with many viewers also on their computers, tablets and mobiles. According to the Econsultancy/ IAB report, The Multi-Screen Marketer, the way viewers engage with their other screens changes depending on what program they are watching. We’ve broken down the percentage of commerce and non-commerce activities for seven major program areas as well as highlighted the top activities for specific programmes and put them in a handy infographic.